February 2019 – New York extended season ‘DANIEL SLOSS: X’ – MORE SHOWS ADDED! 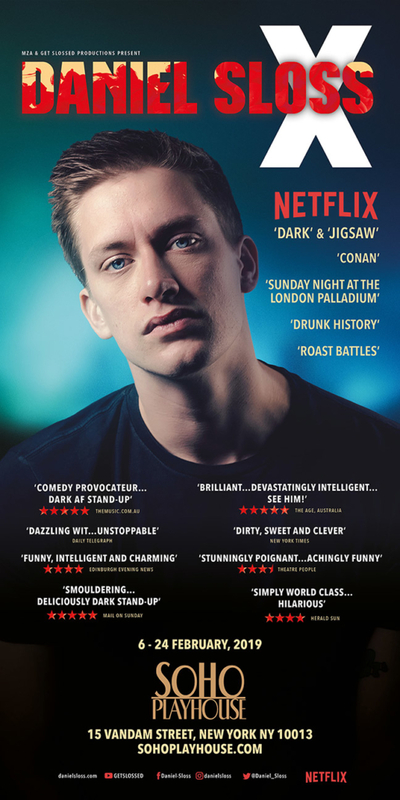 Due to the overwhelming response that Daniel is receiving as he tours throughout Europe and the UK, he has decided to present his most recent show Daniel Sloss: X instead of the previously advertised show Daniel Sloss: NOW. Daniel is quite unique in that despite being just 28, he has already created no less than 10 solo shows until now. Two are on Netflix and the next in the sequence of being written is NOW, a wonderful show that received 5 star rave reviews and which Daniel is keen to present the show at a later stage. But Daniel Sloss: X is very much of the moment and Daniel is very excited to have people see it at this current time. If you have seen Daniel live before or have watched his Netflix specials, you will be aware that his shows often contain challenging and adult themes of a sexual nature as well as strong language and X is no different. Please contact the venue if you require more details. Thank you.